The digital dominoes are easy to build and very forgiving. These two videos by Dave Jones are a good way to learn. The first is about all the tools you might want to equip an electronics lab. For the dominoes you shouldn’t need more than an iron, sponge, and solder. The second video is about good soldering technique. Make Blog covered the dominoes. Dominoes now available from Fun Gizmos! The nice folks at Fun Gizmo’s are now selling the dominoes. If you need more (and aren’t in Los Angeles) hit them up here. With a couple of pieces of paper, someone (who?) at CrashSpace got two dominoes to trigger in a loop! We had a great little build night at CrashSpace. We introduced one person to the joys of soldering. A few other people got their kits together and even giggled as they started playing with them. The Digital Dominoes were designed to be hacked and Matt really took advantage of that. He increased the power, by doubling up CR2016 batteries in the battery holder. He swapped in a couple big LEDs of different colors. 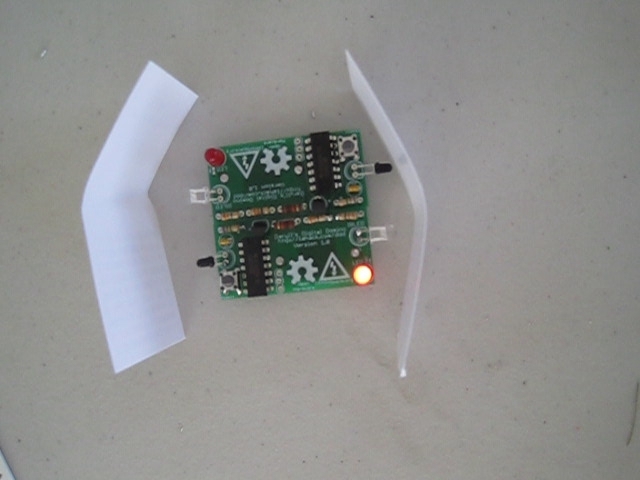 He added a potentiometer to adjust the timing of the blinks. The piece de resistance was using the digital dominoes as a timing circuit to pulse a relay driving a heat gun! Check out the blog post and videos in the CrashSpace blog. I’ll get some more information posted on how you can hack the dominoes soon. Daryll’s Digital Domino wins a 2011 Maker Faire Editors Choice award! I’m honored that they liked them. We’re doing a kit build at CrashSpace on June 1st at 8pm. We’ll have kits available for sale for $20 (tax included). If you already bought a kit bring it by and we’ll help you build it. Bring your assembled dominoes as well. Hopefully we’ll get a big batch of them make a fun display. Today was great at Maker Faire. Our table was full all day with people making boards. Here’s a neat video of a Pulse Generator using Digital Dominoes. The circular pattern of the dominoes keeps going and each time around it lights up the rest of the dominoes. We’re releasing Daryll’s Digital Domino (DDD) at Maker Faire at the CrashSpace booth in the Hackerspace area in Fiesta Hall. What’s a digital domino? It’s an electronic toy. You lay out a line of digital dominoes and then knock them down by pressing the button on the first one. Each one then knocks down the next by sending an infrared pulse. We’re giving them away at the show for people who want to solder one up. We’re also selling kits containing four dominoes for $20 (tax included). If you bought one of the kits at Maker Faire here are the build DDD Build Instructions. The digital domino is designed to be hacked. Come back to the site after this weekend and we’ll post some ideas to get you started. If you want a sneak peek of the progress check out the CrashSpace Wiki project page.